If you’ve read my last few blog posts you’ll know how enthusiastically I embraced the Women’s Tour Down Under earlier this month and you’ll also know that I’ve been trying to catch up with the Race Director Kimberley Conte. The good news is that I spoke with her late last week and got some insights into the future of the race and the exciting plans ahead. By speaking with Kimberley I could tell how passionate she is about the race and women’s cycle racing in general. She revealed that lots and lots of planning went into the race. She and others had worked hard to get the teams, especially the international ones to the start line. “It’s fun to hand over to the riders when the race begins and allow them to tell a story. I just love taking a step back and letting the first race of the season unfold,” she said. Every year the team behind the race works to push it up a step in terms of technical input, police and traffic management, course development and riders. “We’re very mindful of getting too big, too quickly so while World Tour status is a long term goal we don’t want to focus on that. I’ve seen other races focus too much on it and they lose the flavour of the event. “We also don’t want to view the Women’s Tour Down Under in isolation from other events. We work in cooperation with the Cadel Evan’s road race to ensure that the international teams can transition from one to the other. We are also mindful that our race is a good training block for riders heading to Europe to ride the hotly contested Spring Classic races,” she added. Kimberley is full of praise for the South Australian Government which now offers equal prize money for the men’s and women’s TDU. “Ultimately it’s the right thing to do. It is like one piece of the puzzle in elevating women’s cycling and makes it a viable sport for the competitors. It’s great to see that other women’s races have followed suit,” said Kimberley. I also asked the very humble Kimberley about her background. She has the faint traces of an American accent but has embraced Australia as her new home since arriving here in 2010. She moved to Australia as a para-cycling coach and settled in South Australia, after coaching triathlon in the US. 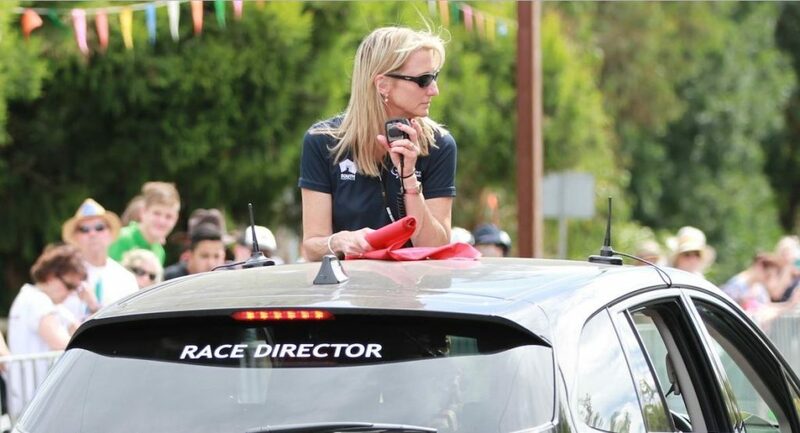 Before the opportunity arose to take up the role of Race Director for the Women’s TDU she ran many other events in para and men’s cycling as both a Race Director and Commissaire. We finished our chat with my favourite question I like to pose – What can we do to get more women riding bikes? Kimberley believes this needs to start at grassroots level with pathways for women to cycling whether it be social, commuting or racing. She’s a member of a women’s cycling club in Adelaide called the Skinny Lattes and her club is very welcoming of new members and provides them with a safe place to ride a bike. “For me it’s a strong reminder that if I can do this (cycling), I can do anything”. Well said Kimberley. Did you enjoy reading about the Race Director of the Women’s Tour Down Under? Who else would you like to hear from in a future blog post? Share via comments or the Women Who Cycle Facebook page.